Creating this wonderful arrangement is not all that hard. If you look closely it's just pots inside of the large pots and then filled in with broken pot pieces. Before we get ahead of ourselves let's step back a bit. First you want to get together all the broken pot pieces you have laying around. If you don't have any then it's time to find the inside pots first. This will help when deciding the largest pot for the outside. Get all the pottery pieces together. Lay out a small pattern on the ground with where you think the pieces of pottery will fit the best. Next get the largest pot that will hold all the pieces of pot shards & other smaller pots. Fill the base with potting soil. Next place the medium size pot inside the large pot. 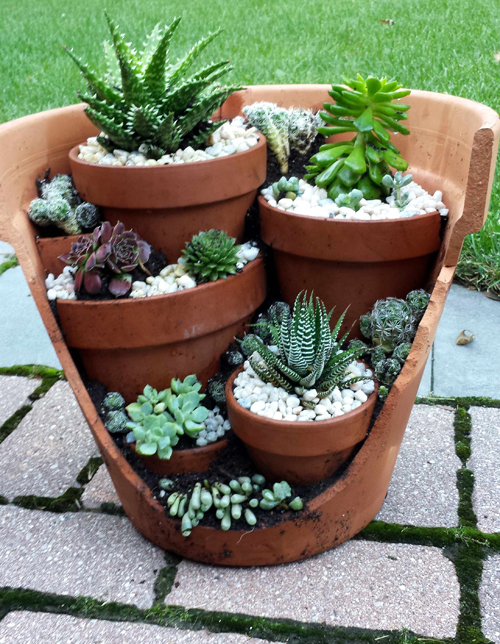 Fill around it with another medium pot shard and then put the smaller pots in front. Fill the space in the back with soil and place the med large pot there. You should now have the arrangement you want. If this isn't exactly right, keep replacing pieces with others till you get the right layout. 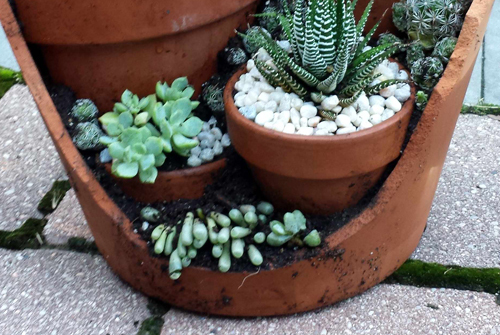 Now it's time to fill the pots and shards with the plants, succulents or cactus. Place them into the pots and fill the pots with soil as you move around from pot to pot. Leave enough head space to place the decorative rocks. 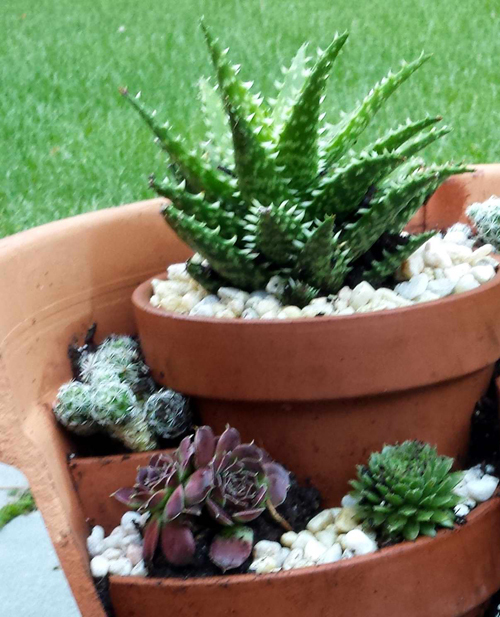 If any of the pots or pot shards move then pack in more soil till its holding them firmly in place. Phew... now sprinkle lightly with water trying not to water the plants themselves but the soil they are planted in. Once the soil is moist you should be able to top the pots with decorative rocks.